Fort Knox FCU’s money market account balances have declined by approximately $11 million in the past five quarters. To combat higher yielding money market accounts from mutual funds, the Kentucky cooperative is raising its own rates. Fort Knox Federal Credit Union ($1.5B, Radcliff, KY) had approximately $180.5 million in money market account balances as of the second quarter of 2018. The Bluegrass State credit union would like to keep it that way for the third. In the past five quarters, Fort Knox’s money market account balances have declined by approximately $11 million. That’s a function of the new interest rate environment, says credit union CFO Jake Darabos. In September 2018, the Federal Reserve raised the federal funds rate for the third time this year to a range of 2% to 2.25%. Looking ahead, Fed officials expect at least three additional hikes in 2019 and one more in 2020. 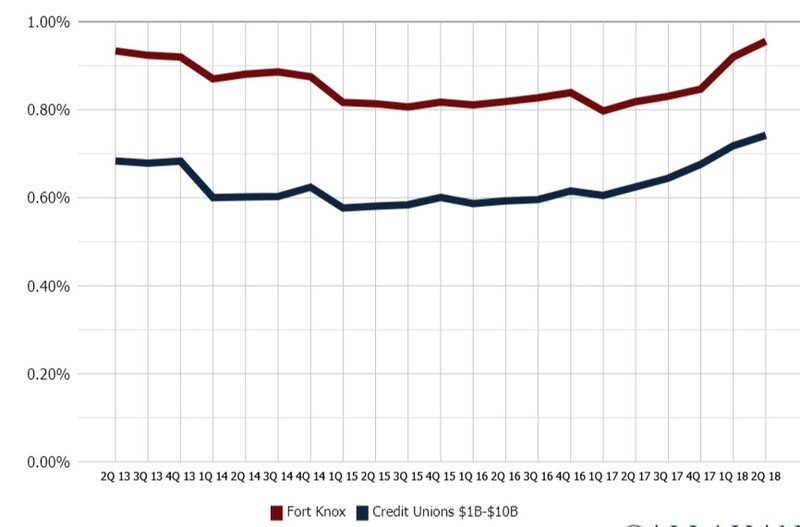 For credit unions, these rate hikes can have a large impact on their deposit portfolios — and Fort Knox is no exception. In this Q&A, Darabos discusses the credit union’s need for deposits, raising rates on its own money market accounts, losing business to mutual funds, and more. What is the need for deposits at Fort Knox FCU? Jake Darabos: We’re seeing money market funds moving out of the credit union and into investment companies like Vanguard and Edward Jones. We know members can get a better return by switching to a mutual fund money market account than they can at a traditional financial institution. And historically, money market rates at financial institutions have lagged behind the mutual funds. 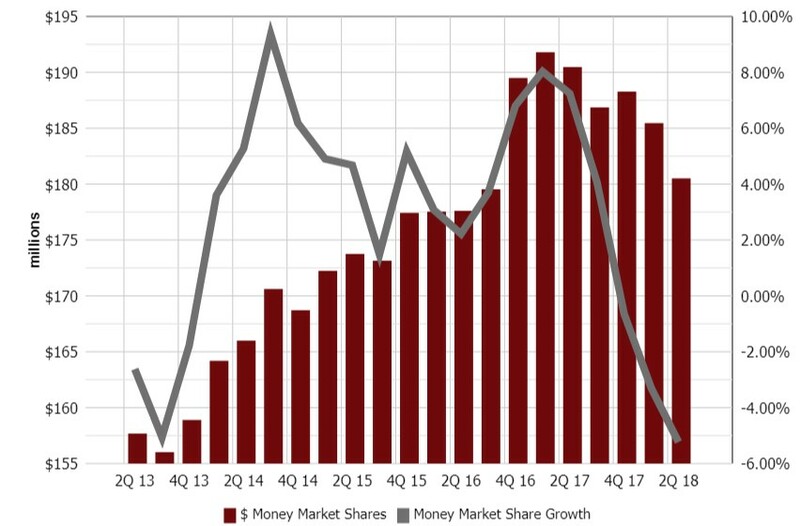 Balance growth in money market accounts at Fort Knox FCU declined for the third consecutive quarter in the second quarter of 2018. JD: A year ago the difference between a credit union mutual fund money market rate was maybe 25 to 50 basis points. Some members certainly could have moved their relationship from a credit union to a mutual fund, but I think for most a bump that size wasn’t worth the inconvenience of having to move. With all the fed funds rate changes, that gap is widening significantly. Money markets at mutual funds follow the fed fund rate more closely than traditional financial institutions — we are not going to put a 25-basis-point increase on a money market every time the fed funds rate goes up 25 basis points. We are at the point where some mutual fund money market accounts are paying 2.5% or 2.6%. And the top of the credit union market, or at least the market we look at, pays 75 to 100 basis points. I don’t think a 25-basis-point difference is worth it for a member to switch, but 100 to 150 basis points is. How does the credit union compete for those deposits? JD: Obviously, we can compete on CD rates. We can raise those and attract some new deposits. But it comes at a significant increase to our cost of funds. Right now, nationally, you can get a one-year CD for 2.8% or 2.9%, and we’re seeing some with no early withdrawal penalty. So, it’s essentially a savings account with a higher yield. So, we looked at our money market, instead. We want members to invest in it. We want to offer them a good yield. The average cost of funds at Fort Knox has climbed 14 basis points in the past two years as it, and the industry, starts to raise rates from the historic lows of the early 2010s. Curious how your cost of funds ratio compares to peers? Let us walk you through your numbers with a custom performance audit. Sign up now. Talk more about the money market product. JD: We’re structuring a new money market that gives members more funds availability than they would get in a traditional CD but a little more restrictive than a savings account or a checking account. To have a higher-yielding money market, we will have higher minimum balance requirements — set around $50,000 to earn the higher rate of interest, something around 150 basis points. We’re limiting the account to one withdrawal per month and requiring a fee for withdrawals above that. Why did you choose these parameters? JD: The terms give us more confidence the money is going to stay here longer, that members are not going to use this as a transactional account or a place to park their money until they need it in their checking account for a bigger purchase. We’re also hoping to attract some new deposits from our local market, but primarily this is about giving our members an alternative to moving. What will the rate be? How close do you want to get to what the mutual funds are offering? JD: We’re still doing financial analysis. We want to be close enough without the rate negatively impacting our cost of funds. In my experience, anywhere between 75 to 100 basis points is not quite enough for a member to act. If we can remain somewhere in that range, we’ll see good success. Psychologically, 125 basis points pulls a different trigger than 90 does. One hundred basis points or less is a good gap to keep. What do you want to accomplish from a balance sheet perspective? JD: At the end of the day, if we can see that our total money market portfolio is staying flat and consistent, that’s a win. This will have slowed down some of the outflow. Certainly, if we see an increase, we’re happy with that, too. You’ve mentioned cost of funds. Where do you anticipate it moving? JD: We’ve seen an increase in cost of funds year-to-date, primarily driven by higher rates and more competition in the CD market. I anticipate that going up next year as well because we anticipate more Fed movement. But if this product can attract some of those dollars that would otherwise go into a one-year CD at 2.5% and were instead going into a 1.5% high-yield MMA, that will help us maintain our cost of funds and keep it from growing more quickly than it otherwise might. JD: We wanted to try something new, something creative. If we see a good response, that’s great. And if we don’t see a good response, then we’ll try something different.